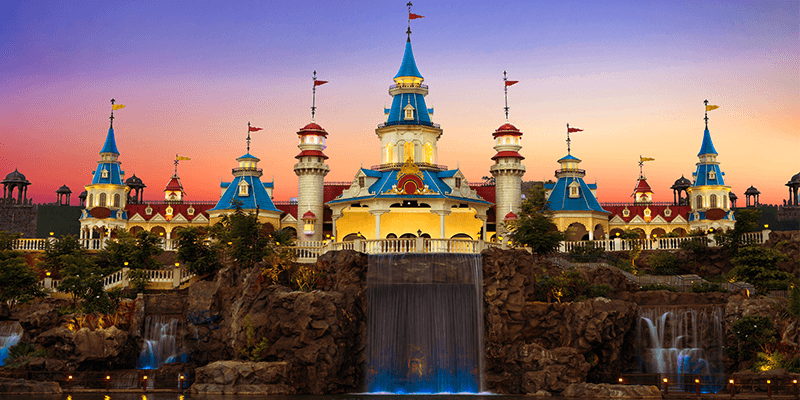 Home Travel Get Set for an Awe-Summer Family Vacation at Imagica! 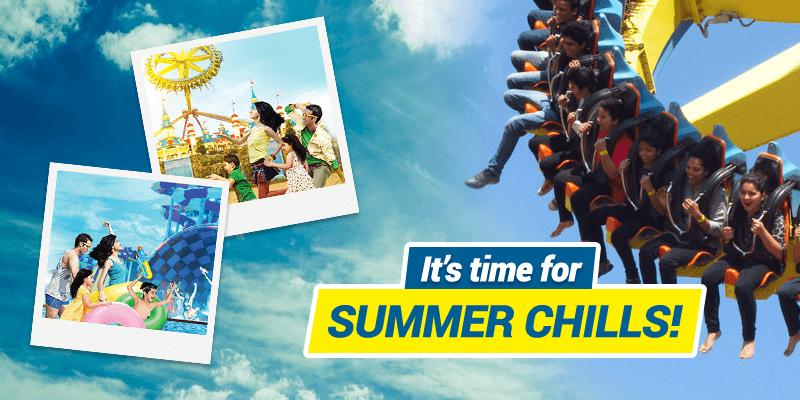 Get Set for an Awe-Summer Family Vacation at Imagica! Come summer, with the rising temperature, also rises every kid’s energy meter. Their parents too get busy filling up their travel bucket list to keep the kids entertained, and also make their summer learning fun. However, look no further, as Imagica has got you covered! Imagica – India’s only International standard Themed Destination, brings you the right mix of fun, excitement and thrill with the unparalleled Theme Park, Water Park and Snow Park. That’s not all! Imagica also takes care of your stay with a world-class accommodation at Novotel Imagica! Adlabs Imagica, Khopoli – create memories for a lifetime! With an aim to keep every family member entertained, Imagica brings myriad attractions, including the country’s largest roller coaster and 4D stimulation rides at the Theme Park. Imagica’s Water Park follows with an exhilarating set of rides and attractions, ready to sparkle up your summer vacation. Also, sending out summer chills, the not-to-be-missed Snow Park is sure to bring out the child in you with simulated snowfall, and snow-filled adventure. Moreover, to curb hunger pangs, Imagica offers specially curated multi-cuisine restaurants and food kiosks ranging from African, American to Indian food styles. Located at Khopoli, an hour and a half’s drive from both Mumbai and Pune, Imagica also trumps on its entry prices starting at a mere Rs. 999 onwards. Guests are in for a treat as Imagica has also launched a summer special Buy 2 Get 1 Free offer for pre-bookings on www.adlabsimagica.com. Imagica ensures optimum enjoyment, whether you are visiting with Friends or Family. For the adventure seekers, there are roller coasters and high-speed rides such as Scream Machine, Nitro and Gold Rush Express.While kids may have fun at the Mambo Chai Chama, Tubby Takes Off, Wagon-’O’-Wheels and more, the young-at-hearts can experience the thrilling attractions, Mr India, I For India, Rajasaurus, Splash Ahoy, amongst others. Imagica also offers magnificent indoor AC attractions such as Salimgarh, The Detective Bow Wow show, The Magic Box and much more. Imagica has continuously been adding newer attractions every year. Staying true to this tradition, come April – children’s favourite character Chhota Bheem and his friends will find a permanent home at Imagica. Chhota Bheem will meet and greet his fans, and lift their spirits by being a part of the entertainment extravaganza- the Grand Imagica Parade. That’s not all! Guests will also have a plethora of interesting Chhota Bheem merchandise to choose from and take back home. Beat the heat at the Imagica Water Park! 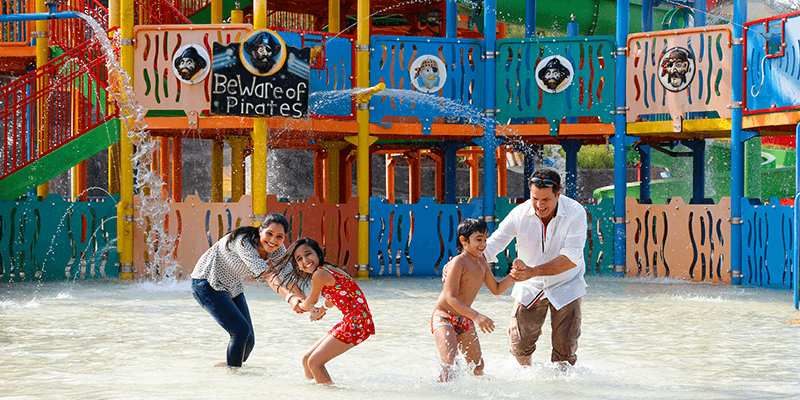 While at Imagica, head to the Mykonos-themed Water Park, where there is never a dull moment. The non-stop upbeat music sets the perfect tone to party at the Wave Pool, and the water slides shoot up the thrill meter. Get on the exciting rides, splash away at the Zip Zap Zoom in the looping aqua tubes, and twist and turn at the Swirl Whirl at Imagica’s Water Park. From crazy slides to lazy lagoons, it is the best place to escape the mundane routine! The restaurants offer an appetizing range of quick snacks, meals and beverage to keep you hydrated and full, while you enjoy at the park. Excitement doubles as Water Park guests now get free access to the majestic Grand Imagica Parade and other attractions at the Imagica High Street. Furthermore, Imagica adds another feather to its super exciting offering with the recently launched Imagica High Street. This distinct concept gives guests a glimpse into the world of unparalleled entertainment, partying, shopping and a delectable range of food and beverage options to choose at Imagica’s Theme Park. That’s not it! To access more rides and attractions, guests can easily upgrade their entries at multiple Upgrade Stores inside the Park. 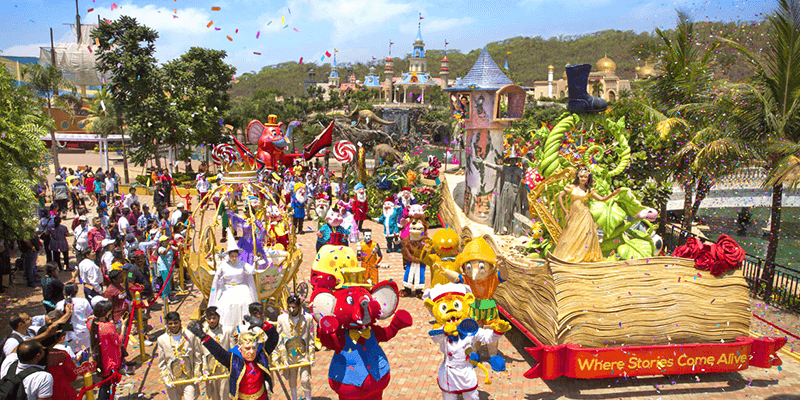 Adding more glamour to the vivid attractions, Imagica offers an exquisite meet and greet with the Stars of Imagica. Hopping on the bandwagon is Chhota Bheem and his friends.As the charming characters Tubby, Mr India, Mogambo, Rajasauras and more stride into a royal march, the one of its kind Grand Imagica Parade also showcase acrobats, street performers and much more to amplify the fun. 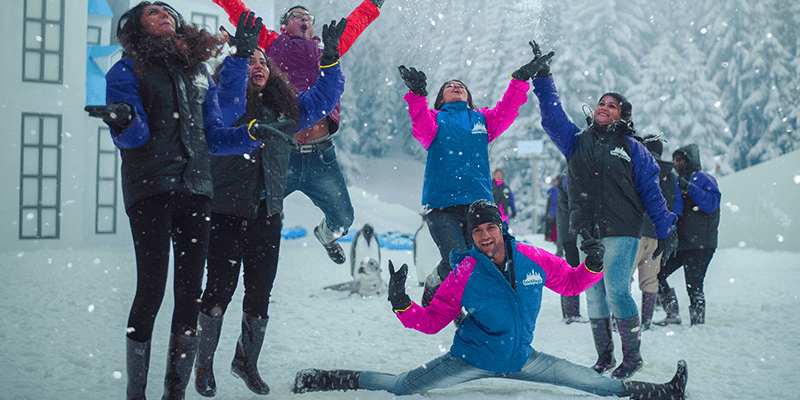 Promising unlimited fun, Imagica houses India’s largest indoor snow park. The magnificent snow slides, hiking, snow disco and more, make the visit to the Snow Park a must if you wish to wave goodbye to the summer heat. The striking backdrop of an igloo and other ice sculptures sure sets the tone right for a perfect vacation. Note: You will be provided with all the necessary winter wear to keep you safe from catching a cold! Jacket, hand gloves and snow hiking shoes are available free-of-cost at the Snow Park. To complete the Imagica experience- soak into some retail therapy as it houses a wide range of shopping outlets. You can choose from a wide range of souvenirs and gifts to take back home at the multiple retail kiosks and stores spread across the park. With this and so much more, Imagica truly is the destination that one can’t miss out on this summer. Hurry! Login to adlabsimagica.com to book your tickets and Save Big! Previous articleRoad trips in Thekkady that bring you close to nature! Next article4 Must visit National Parks in Dooars! Ramoji Film City is one of the prime attractions of Hyderabad.It is also a popular tourism and recreation center, containing natural and artificial attractions including an amusement park. Around 1.5 million tourists visit the place every year.